5300 McConnell is a repositioning of a 1984 concrete tilt-up building in the Playa Vista Tech District of Los Angeles with the Centinela Creek Channel as its backdrop. Initially built in 1984, the 73,000 square-foot building offered a generic appearance – an anonymous solution to an unknown office tenant. 30+ years later the building has a new life, bringing specific solutions to siting and targeting creative office tenants to reinvigorate the space. 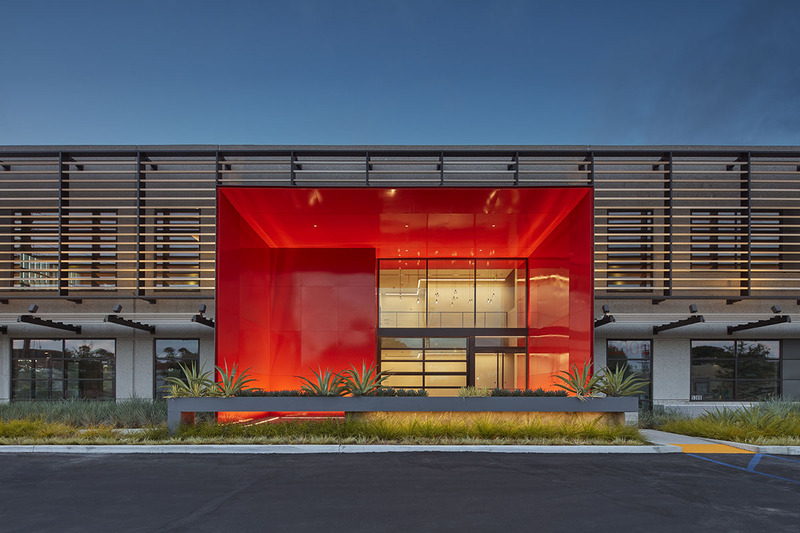 On the south façade facing the street and approach, a bright red metal enclosure frames the main lobby entry – a clear wayfinding marker for visitors, and an anchor for the long horizontal south elevation. Dark zinc cladding wraps the outside of the enclosure, further focusing the bright red entry. On the west and east facades are smaller versions of the enclosure marking future tenant entries. Landscape elements at the building perimeter include a raised planter in front of the main lobby, creating a gentle buffer to vehicles and marking the edge of where the building and landscape merge. The same approach is applied in specific spots around the building where smaller entries and private tenant patios emerge from the landscape. A system of aluminum louvers is installed over a dark steel structure, shrouding the top portion of the two-story building to mitigate solar heat gain and glare. On the southern-facing façade, the louvers are placed horizontally to shade the nearly vertical rays of the sun, while on the west-facing façade the louvers are oriented vertically, blocking the low afternoon sun. This shift of orientation offers a sophisticated appearance to the screen giving a new fresh look to the existing shell while functioning as a performative element. The aluminum louvers painted in a gradient of four subtle colors shift across the façade, mimicking an oversized, super graphics wood grain. At night the illuminated screen glows, making the building appear as an inviting lantern. New high-performance insulated glass further improves the energy performance of 5300 McConnell.